Gwaii Haanas National Park Reserve is a very large, very remote and very difficult area to access. The itinerary must always be flexible and adapt to weather conditions, logistical challenges and the interests of each group. We always endeavour to provide you with the safest, most interesting and time effective trip possible. Primarily because of the large distances involved, all trips travel either north to south or south to north. In order to accomplish this, guests begin their trip by flying from Queen Charlotte City to a destination point in either the northern or southern reaches of the park. The full six-day trip will then be capped off by another "flight seeing" trip returning guests directly to Queen Charlotte City on the morning of their seventh day. We try to get going fairly early in the day to make the most of our time in Gwaii Haanas (i.e., up at 7 to 7:30 and away by 8:30). We travel, relax, explore and prepare meals together. We'll be stopping several times a day to go ashore and experience the rich natural and cultural points of interest in Gwaii Haanas or to kayak for a few hours in a quiet bay or along an interesting reef. At the end of our travels for the day we find a quiet anchorage, prepare our evening meal and perhaps go for a paddle to absorb the peace and tranquility of this magical place. You need to arrive on the Charlottes at least the day before the day of departure on the Gwaii Haanas trip. If you have the time, consider building at least two days into your travel plan to explore Graham Island (preferably after your trip with us – see “Departing” below). There are lots of interesting and beautiful things to see and do on the north island. There are two ways of getting to Queen Charlotte City, either by air from Vancouver to Sandspit or via B.C. Ferries from Prince Rupert, B.C. If you fly into Sandspit, take the airport limo to Queen Charlotte City ($20.00/person including ferry fare). This takes about an hour including the ferry trip across Skidegate Inlet. The limo will drop you at your hotel, B&B, or campsite. Accommodation should be previously arranged. If you sailed across from Prince Rupert via BC Ferry Service, you’ll dock at Skidegate Landing - about a five-minute drive or cab ride from Queen Charlotte City. It is not a good idea to book your outbound flight from Sandspit or BC Ferry sailing from Skidegate to Prince Rupert on the morning of your scheduled return to Queen Charlotte City. Fog, wind or any one of a number of other glitches may delay the Inland Air Charters flight causing you to arrive back in Queen Charlotte City too late to make your travel connections. What follows is a general outline of how a six-day trip might go. Weather conditions and the interests of the group often determine the actual itinerary of our trip. You’ll have some responsibilities in terms of helping with day to day tasks but also have a large measure of control over the pace and focus of the trip. We try to get going fairly early in the day to make the most of our time in Gwaii Haanas (i.e., up at 0700 to 0715 and away by 0830 – 0900). We travel, relax, explore and prepare meals together. We'll be stopping several times a day to go ashore and experience the rich natural and cultural points of interest in Gwaii Haanas or to kayak for a few hours in a quiet bay or along an interesting reef. At the end of our travels for the day we find a quiet anchorage, prepare our evening meal and perhaps go for a paddle to absorb the peace and tranquility of this magical place. All of my Gwaii Haanas trips travel in ‘one direction only”, meandering either in a generally southbound or northbound direction. For purposes of giving you an idea of how a trip might go, the following itinerary is based on a southbound trip. A northbound trip follows roughly the same itinerary in reverse with perhaps a few minor changes to accommodate logistical issues (tides, wind, etc.) and the specific interests of the group. I try to visit at least one new place on each tour. No two trips are ever the same. You must stay in Queen Charlotte City the night before your trip is scheduled to begin. There are several great hotels and B&B's in Queen Charlotte City. Pick one that serves breakfast early (0630…0645 latest) as we’ll want to get going with our day as soon as possible after your arrival at the boat. We will pick you up at approximately 0730 (a.m.) in order to catch the 0830 ferry from Skidegate to Alliford Bay. From Alliford Bay it’s approximately a one-hour drive to Moresby Camp where we’ll board the M.V. Island Bay. After stowing our gear and a vessel safety orientation we're off on the first day of our adventure. 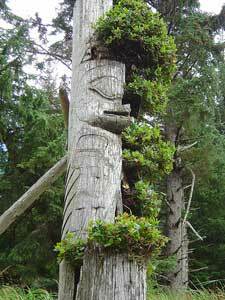 First stop will likely be K'uuna Llnagaay (commonly known as either Koona or Skedans village), a spectacular ancient Haida winter village site with several standing totem poles. K'uuna Llnagaay is situated on the eastern tip of Louise Island and faces south onto Skedans Bay from a crescent beach forming the neck of a small peninsula. 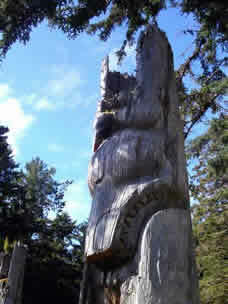 It’s name means Village at the Edge, but it was also known by the Haida as Grizzly-Bear-Town because of the large number of grizzly bear carvings to be found there; traders from away named it Skedans, a corruption of the name of its chief, Gida'nsta. In the mid-1800s almost 450 Haida lived here in about 26 longhouses. An 1878 survey shows record of 56 monumental cedar sculptures, including frontal poles, single and double mortuary poles, memorial poles and mortuary figures. The famous Canadian artist Emily Carr visited K’uuna Llnagaay in 1907. Through most of the carvings have now returned to the earth or been removed, K'uuna Llnagaay is one of the few remaining village sites with standing poles and remnants of large longhouses. Crests featured on the poles, such as rainbow, frog, eagle, beaver, and two-finned killer whale, signify which families lived here. A path winding through the old village allows you to appreciate the artistry of the poles, now in varying stages of decay, and provide a glimpse of what life may have been like here many years ago. An hour and a half south of Skedans lies the hauntingly beautiful village of T'aanuu Llnagaay (Tanu village). T’aanuu is located on the east shore of Tanu Island, on Laskeek Bay. T'aanuu means eel grass, which commonly grows in shallow water around the village. Its people were very fond of sea bathing, so others would tease them—hence the name. It was also called Klue's Village after the original town chief. Emily Carr came here to paint in 1907. T'aanuu Llnagaay follows the shoreline of two beaches divided by a rocky shoal. In the mid-1800s the village had about 550 inhabitants. More than 25 longhouses, 31 mortuary columns and 15 mortuary houses were recorded then. Present-day visitors notice the many logs on the ground and may mistake them for windfalls; however, these are the posts and beams of old longhouses. These longhouses faced the shoreline and were dug down for protection from the weather—large, rectangular pits mark their locations. Though there are no standing poles here, on close inspection you can see ancient carvings made smooth by time and furred by moss. Walking amidst the ruins, surrounded by the protective rainforest, one gets a strong sense of the people who lived here. It will be a big day if we manage to visit both K’uuna and T’aanuu and we’ll then be looking for a place to anchor for the night on the north end of Lyell Island. If weather permits we'll head southward along the eastern side of Lyell Island stopping at Hlk’yah Llnagaay (Windy Bay) to stretch our legs, meet the Watchpeople and explore a really interesting culturally modified forest (and I don't mean a stump ranch like us late coming cultural modifiers have left in our wake). Hlk’yah Llnagaay. (Falcon Town) located on the exposed eastern coast of Lyell Island was the site of a major village and later of a summer fishing village, although neither are apparent today. Near here in 1985, the Haida blocked logging roads in their struggle to put an end to logging on Lyell Island and to protect the area that became Gwaii Haanas. The longhouse-style cabin named "Looking Around and Blinking House" honours this victory. 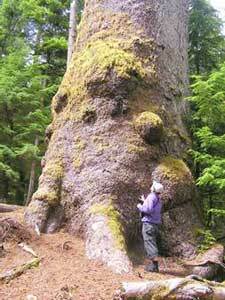 At Hlk'yah GaawGa the old growth forest contains trees over 1000 years old and up to 70 meters tall. A trail leads through huge Sitka spruce and western red cedar trees, draped with mosses and lichens. Watchmen can point out culturally modified trees. Some of these trees have test holes cut in them to check their appropriateness for making a canoe or carving a pole. An hour further south from Hlk’yah Llnagaay will put us in Murchison Anchorage - a beautiful spot to paddle, particularly at low tide and our likely home for the night. Depending on the level of the tide, we'll either go for an early morning paddle or head to the nearby hotsprings for a soak. Hotsprings Island is spectacular and well worth a visit by itself. I'm a bit prejudiced on this but I think that it's definitely the best hot springs in B.C., possibly even Canada or even...maybe... the world! Definitely a 10 in any case. Gandll K'in Gwaayaay (Haida for Hot-Water-Island) was well known for the healing and spiritual qualities of its natural thermal pools. This is a sacred place for the Haida. There was a village located on the east side of the island but little evidence is visible today. We usually come ashore on the northeast side of the island. A short trail leads through lush forest to the Watchmen cabin. After signing in, we rinse off in the nearby bathhouse, whose showers are fed by the springs. The largest pool is nestled amidst salal bushes and crabapple trees. A trail leads up and over a seepage meadow to the cliff-side pool. Relax while enjoying views over Juan Perez Strait to the rugged peaks of Moresby Island. Further down the trail, the more intimate beachside pool is only steps away from the ocean. After enjoying the pools we’ll be moving south again, likely to Island Bay in the north Burnaby Strait area. We might try to fish up dinner along the way and will very likely want to get a paddle in as well. Burnaby Narrows lays a short paddle from Island Bay. Some references say it has the densest display of sea life on the Pacific coast. Records aside, it does present an opportunity for two or three of the most enjoyable hours you’ll spend in a kayak. An incredible array of intertidal flora and fauna residing there to take advantage of the twice daily tidal delivery of nutrients, become exposed and visible at low tide. A kayak - maneuverable, quiet and otherwise unobtrusive, is the perfect craft to view this natural splendor. As the tide rises a passage opens miraculously, saving us the long and sometimes arduous voyage around the outside of Burnaby Island. By noon we’re usually through ‘The Narrows" and into beautiful Skincuttle Inlet. There are many opportunities here for pristine ancient forest walks, exploring streams that later in the year will provide unaltered habitat for several species of pacific salmon. We choose to end our day by traveling a bit further south or we may just stay put in Skincuttle for the night. The area south of Skincuttle Inlet and particularly west of Houston Stewart Channel separating Moresby Island from Kunghit Island offers great bird watching opportunities with Tufted Puffins, Rhinoceros Auklets, Cassin’s Auklets, Storm Petrels, Sooty Shearwaters to name a few, being common. If we’re lucky, we might see a Horned Puffin, as the southern Charlottes are the only place that they nest in Canada. We've often seen humpback, orca and Minke whales as we head south from Skincuttle Inlet en route to the southern reaches of the park. I often go into Rose Inlet for a paddle and walk through an old Haida industrial park where they obtained much of the raw materials required to sustain their culture (bark, logs for manufacturing canoes, poles, houses etc.). Walk on a magnificent black sand beach, explore natural caves or paddle the tidal pools in the Gordon Islands a truly west coast setting. The southern reaches of the park are really spectacular and offer lots of choice for the day's activities. The weather (i.e. wind speed and direction) will often make the choices for us but we'll try to accommodate the collective will of the group as much as possible. We may end up the day in one of the protected bays of Louscoone Inlet. Perhaps needless to say, there's nice paddling here too! SGang Gwaay Llnagaay, the most southerly Watchmen site, is on the small island of SGang Gwaay, shown on charts as Anthony Island. It is off the far southern tip of Moresby Island and west of Kunghit Island. SGang Gwaay refers to the wailing sound made when winds push through a hole in the rocks at a certain tide level. The village is also named Nang Sdins Llnagaay (Ninstints) after one of the village chiefs. In 1957 eleven of the best-preserved poles of SGang Gwaay Llnagaay were removed and shipped to museums in the south. Despite this, the village has the best array of ancient Haida longhouse remains and poles standing in their original location. In 1981 UNESCO declared SGang Gwaay a World Heritage Site. Over two dozen poles remain, as well as the posts and pits of several longhouses. In 1995, after consultation with chiefs and elders, a number of the poles were straightened to prolong the period before they return naturally to the earth. SGang Gwaay Llnagaay was a major village of the Kunghit Haida, the most southerly of the Haida. It held over 300 inhabitants in the late 1830s. However, in 1862 a disastrous smallpox epidemic wiped out most of its inhabitants. By the late1800s, the few remaining residents had moved northwards at the invitation of Chief Skidegate. This was despite being traditional enemies with the Skidegate Haida. Today, the village is approached from a beach and anchorage at the north end of the island. A boardwalk trail winds through lush forest with caves and rock outcrops that would have provided defenses in the old days. After passing the Watchmen cabin, your first glimpse of the poles is through the trees; then suddenly you are confronted by a row of massive, weathered mortuary poles carved with bears, whales, and eagles. These poles speak of the power of great families of this village, more than 150 years ago. Walking onto the sand of the crescent beach and looking back towards the village, you may feel the spirits that remain here. At low tide, canoe runs—areas deliberately cleared of rocks—are still visible on the beach. The names may be somewhat confusing but the impression that Nang Sdins leaves is most certainly not. Spectacular, fabulous, incredible are only a few of the adjectives that people conjure up to describe this place. Nang Sdins remains as the only example in the world of a traditional northwest coast first nations village, complete with standing poles and the remains of massive cedar longhouses. The progression of human evolution from cave dweller to masters of architecture and culture remains clearly evident. The Haida’s ability to not just survive but to thrive on this small windswept island is a tribute to man’s indomitable ingenuity and force of spirit. A hike to the west side of the Island, kayaking in the northern reefs of SGaang Gwaay or possibly a visit (weather permitting) to the spectacular sea lion colony off the southwest side of the Island are all options for the afternoon. A visit with friends in Rose Harbour completes an interesting day. These folks live lightly on the land and teach by example that a simpler existence is possible and rewarding. They often generously invite us to explore the remains of the Rose Harbour Whaling Station or to view a partially finished Haida canoe on their property. Susan often prepares a splendid organic vegetarian meal with homegrown ingredients to cap an incredible day. The following morning sees you packed and heading north for Queen Charlotte City via “Beaver” floatplane, an adventure in itself. Inland Air Charters employs several very competent and knowledgeable local pilots that have accumulated an impressive safety record while servicing all points of the islands over the past fifteen years.